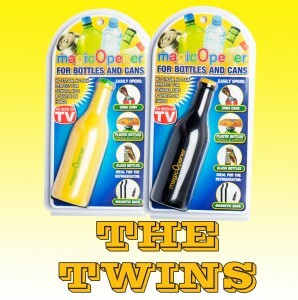 If you are looking for great bottle openers then trust Magic Opener where we offer some great bottle and can openers. With the technological advances, various unique and different kitchenwares have come up. Nowadays, a lot of exclusive kitchen tools have been produced in order to make life easier and effortless. One such tool, which is highly demanded by most of the people, especially the household ones is the magnetic bottle opener. These bottle openers are considered as the most functional and important tool in kitchens today. The major reason why these openers have become a popular consumer item is that they complement the usage of your area as you just have to put them on the fridge and they are always within reach. With these colorful little tools, you can give a different appearance to your kitchen and home. They can be used for several reasons like for opening any cans, bottle caps, beer bottle, soda or juice bottle. In fact, most people, particularly elders and children find these openers to be truly comfortable and easy to use. Moreover, it has turned out to be the most popular refrigerator magnet that everyone would like to buy. Although, this magic product has become popular and useful requirement for your kitchen, but having durable and excellent quality opener can be the best to create a cozy and a homely environment. Therefore, we at Magic Opener are there to help you out. We offer a wide range of novel refrigerator magnets with our openers that are not only of excellent quality but they really work like magic; in fact, they are just the best products that deserve to be in your kitchen. We assure you that you will enjoy the convenience and practicality in using this kind of kitchen tools. You will immediately find out that among all the products, fridge magnet magic opener is the best kitchen appliance that you would ever have. These are indeed one of the most interesting and easy ways of decorating your fridge. They not only look impressive but are too flexible and do not leave any mark besides being well within your reach. You can use them for various purposes like to personalize a photograph of your loved ones, as a token of remembrance at a special occasion, as promotional magnets etc. At Magic Opener, we offer excellent medium to the business personal to market their business campaigns and generate instant sales. These magnets are made available in various styles and designs and are crafted specifically according to the company’s requirements. We ensure that they will definitely meet up your purpose and your consumers’ needs. So spread your message all over effectively and enjoy the magic of using a magnetic bottle opener with ease.